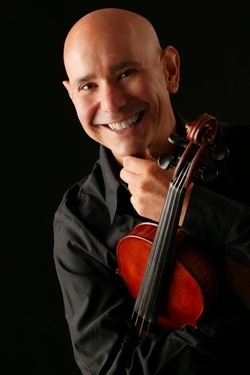 ﻿﻿Hal Grossman﻿﻿, violinist, has been enthusiastically acclaimed by critics and audiences alike for his “vibrant tone” and “superb technique”. As concerto soloist, he has appeared with American, European and Canadian orchestras including the Rochester Philharmonic, North Carolina Symphony, Polish Sinfonietta, and the Illinois, Lima, Clarion, Guelph and Battle Creek symphonies. Grand Award Winner of the Lima Young Artist Competition and Silver Medalist of the International Stulberg Competition, Mr. Grossman has performed for their Royal Highnesses, Prince Charles and Princess Diana, in a CBC television and radio broadcast. Recital appearances have taken him throughout North America and Europe. In the United States he has also been heard on National Public Radio, WQXR-New York, and WFMT-Chicago. Mr. Grossman served as Concertmaster of the Echternach Festival Orchestra in Luxembourg, the llinois, Boise, Lansing and SaginawBay symphonies. He has been featured at the Casals (Puerto Rico), Evian (France), Orfeo (Italy) and, in the continental U.S., the Aspen, Lancaster, Breckenridge, Fontana, Great Lakes, Manitou, and Garth Newel music festivals. Mr. Grossman received First Prize Awards at the prestigious International Cleveland Quartet Competition and the National Fischoff Chamber Music Competition. His New York Debut at Carnegie Hall received exceptional reviews from the New York Times. As First Violinist of the Oxford String Quartet, he performed throughout the U.S. and Europe and recorded several new works for string quartet. Mr. Grossman holds music performance degrees from the University of Michigan and the Eastman School of Music. His primary studies were with Paul Makanowitzky and Sylvia Rosenberg and, in master class, with Isaac Stern, Alexander Schneider, and Charles Treger. Mr. Grossman is Associate Professor of Violin at ﻿﻿﻿T﻿he University of O﻿klahoma﻿﻿﻿ and on the violin faculty at the Aria International Summer Academy. He was formerly on the violin faculty at the Interlochen Center for the Arts and Miami University. Mr. Grossman's students can be found in every major music conservatory in the nation.